Looking for a job in Suwannee County Florida? The following guide provides a listing of Suwannee County top employers to include local government employment portals, healthcare job links, and a variety of schools that provide great teaching and support staff careers. Great resource! 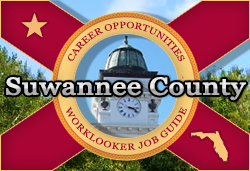 Suwannee County posts job openings when vacancies exist. During this review there were open positions available such as Part-time Library Aide, Maintenance Mechanic, Library Assistant, Custodial Worker, Casual Library Aide, Park Maintenance Worker, Collection Site Attendant, Recreation Aide, and Firefighter EMT / Firefighter Paramedic. Check for updates. Live Oak is a growing community of some 7,000 citizens. The City of Live Oak periodically hires. Visit their site for the latest listings / employment applications. The Worklooker Job Guide for Columbia County covers Lake City area employers. Featured listings include Lake City Columbia County Chamber of Commerce, Baya Pointe Nursing and Rehabilitation Center (Consulate Health Care), Shands Lake Shore Regional Medical Center Lake City, North Florida / South Georgia Veterans Health System, Children's Medical Center Lake City, Wolfson Children's Specialty Center - Rehabilitation Pediatric (Baptist Health) Lake City, Columbia County School District, Epiphany Catholic School, Florida Gateway College, Columbia County Sheriff's Office, Lake City Police Department, Columbia County Fire Department, Lifeguard Ambulance Service Columbia County, and Craigslist Lake City Jobs. Located in Lake City, Florida, Shands Lake Shore Regional Medical Center is a 99-bed acute care hospital that provides a wide range of health care programs. These programs include but are not limited to: cardiology, obstetrics, orthopaedics, pediatrics, physical therapy, radiology and surgery. During review the following employment opportunities were listed: Pharmacy Director, Medical Technologist, Monitor Tech Telemetry, Physical Therapist, Registered Nurse RN Med / Surg, Registered Nurse RN Intensive Care Unit ICU, Registered Nurse Obstetrics / Gynecology, Medical Surgical Nursing Jobs, Surgical Tech, and Ultrasound Tech. Palms Medical Group is a compassionate, patient-focused healthcare provider that covers a wide range of services at multiple locations throughout North Florida. Palms Medical Group offers competitive pay, paid holidays, a generous amount of paid time off, a generous benefits package that includes employer funded life insurance, substantial employer contributions to health coverage, and optional dental, supplemental life, and Aflac plans. They also offer quarterly incentives. During review openings were available in Live Oak for Case Manager, Customer Service Representative, Patient Advocate Coordinator, Nursing Jobs, Certified Medical Assistant CMA, and Licensed Practical Nurse LPN. Gulf Coast Health Care is a leading provider in the long term industry serving in the Southeastern United States. GCHC currently operates 42 skilled nursing and assisted living centers throughout Florida, Mississippi and Alabama with a team of over 6,000 associates. Surrey Place Care Center was hiring. Open positions available had included CNA Certified Nursing Assistant, RN / LPN Registered Nurse / Licensed Practical Nurse, Full time evening shift CNA, and PRN Cook. Family Life Care offers a variety of career options that allow you to work where and when you want, within the specialty you prefer. FLC offers assignments on a full-time or part-time basis with a choice of hours whenever possible. For Registered Nurses and Licensed Practical Nurses FLC offers opportunities on an hourly basis in private duty and general home care. Specialty Nurses are offered opportunities in the fields of pediatrics, mental health and geriatrics. Certified Nurses' Aides, Home Health Aides, Companions, and Homemakers have the option of working private duty and home care on an hourly basis. Shands Live Oak Regional Medical Center is a 25 bed critical care facility. During review there were open positions available for Licensed Practical Nurse LPN Clinic Office, Maintenance Engineer, Medical Technologist, Pharmacist PRN, Phlebotomist, and Receptionist. Visit Shands often for the latest employment listings. The mission of Suwannee County Schools is to educate all students in a safe and supportive learning environment that will develop life-long learners and productive citizens. During review Suwannee County School District Received a "B" Grade. Employment opportunities found had included Intensive Reading Teacher, Custodian, Licensed Occupational Therapy Assistant, Substitute Teacher, Assistant JV Football Coach, Head JV Girls Basketball Coach, Migrant Paraprofessional, Bus Attendant, Substitute Bus Attendant, and Substitute Bus Driver. Interested in joining the Westwood Christian School staff? Contact the school office for more information at 386-362-3735. Kelly Educational Staffing provides dedicated professionals like you with real educational employment opportunities. We recruit, screen, employ, schedule and manage substitute teachers, paraprofessionals and teacher's aides in grades K-12. Assistant Professor, Environmental Science Progr.. Employ Floridais a great job resource. During this review jobs were available for a wide range of career specialties. Make sure you expand all categories so that you can see all positions at-a-glance. Some positions are listed as "any location in Florida". This does not guarantee an opening in Bay County. This site has a job openings e-mail notification feature that's useful. Each CareerSource center has staff dedicated to helping job seekers take advantage of training and employment resources. Whether you need help with the resources in their one-stop center, need assistance with the Web site, need to learn about their free training opportunities, or need connections to open positions, there can help. Craigslist Live Oak and North Florida Help Wanted / Clasifieds had open positions such as Electrician Industrial, Painter, Handyman, Legal Secretary, Carpenter, Registered Nurse RN, Structural Welder, Accountant, Accounts Payable Specialist, Billing Specialist, Custodian, Restroom Attendant, Auto Technician, Housekeeper, Bookkeeper, Receptionist, Administrative Assistant, Clerical Jobs, Clerk, Dispatcher, Landscaping Jobs, Janitor, Housekeeping Jobs, Cleaner, HVAC Jobs, Secretaty/Receptionist, Estimator, Roofer, Customer Service Representative, Medical Biller, Dental Assistant, General Labor Jobs, Office Assistant / Counter Sales Position Available, and more. Suwannee County is a great place to live, work & play. The Suwannee County Chamber of Commerce welcomes the opportunity to serve you. The Chamber of Commerce is a great resource to use for exploring area businesses, economic climate, workforce information, cost of living, and more.